Entering the 2010 campaign, the ceiling of Angel Pagan was seemingly an enigma. A talented outfielder plagued by injuries and bone-headed on the field mishaps, all we could really be confident about was that Pagan was a better alternative in center field than the great Gary Matthews Jr. Up to this point though, hitting in a line-up that lacks a true identity, Pagan has been an offensive propeller for the Mets. So far this season, Pagan has proved all of his critics wrong. Boasting a solid .283 BA, he’s hit in all different slots of the Mets lineup and is well on his way to scoring 100 runs on the season. Pagan has also proved that he’s more of a threat on the bases this year with 12 swipes in 15 chances. He was gunned down a third of the time last season by opposing catchers. Perhaps most surprisingly about Pagan is the fact that he has displayed superb defensive prowess in center, as well as negating his affinity for base running blunders. In addition, Pagan has delivered in the clutch, something that star teammates David Wright and Jose Reyes have struggled to do on a consistent basis. It appears up to this point that Pagan has purified his overall game, and with the return of Carlos Beltran looming for the later part of the summer, the Mets outfield situation will definitely be an issue. As we all know, this isn’t beer league softball and the Mets do not use four outfielders at once. Should Pagan be the odd man out? Should this spark plug of a player be subjected to coming off the bench? Should he be used as a trading piece in the near future? Pagan has been great but he had a very bad weekend against the Orioles. If Beltran ever gets back, the Mets best bet is to platoon right field with Francouer and Pagan, that is is Francouer goes into another funk. 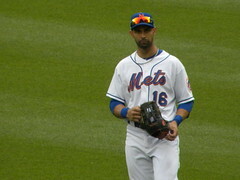 What the mets need to do is turn Pagan or Carter into a second basemen. I think every Met fan would love that lol. It's not as simple as it sounds. Contrary to popular belief, you can't just stick any player at any defensive position and expect results. It's just not how the game works in the major leagues. Four great outfielders, and three spots. Hey, it's a good problem to have. I'd hate to be Jerry Manuel and decide what to do. Pagan's had a fantastic season but Francoeur is an extremely valuable right fielder and clubhouse guy. It will come down to which guy is hitting better when Beltran is ready to come back. Yea guys, I'm sure every Met fan would love that kind of mid-season experiment. When Beltran returns, assuming Pagan and Francoeur are still Mets, the team should go with the most consistent option to play every day in RF. If Frenchy continues to hit in the form of short peaks and long valleys, and Pagan keeps setting the table like he's done most of the season, I'd say you have to give the nod to Pagan for more PT. A lot can change between now and when Beltran comes back. I know, its very difficult to move anyone to any position they dont regularly play. I was stating it would be nice if that could happen. @Wrightoholics, along with @ceetar and @ajgmets is going on with a #SendAnAngeltoAnaheim Campaing to write-in Angel Pagan for the All-Star Game!